The caves or dungeons in ARK are important. Here you find drops, crystals or chitin. However, you should progress already in Level below before your step into cave. You should reach at least level. In the caves you will find creatures such as: Bats, Spiders, Scorpions, Giant boas, Sarco (water) and Piranhas (water). In addition to resources for crafting, you also find artifacts in the caves and there are six in the default map. You need them to conjure Broodmother Lysrix - a special bosses -. Furthermore, you should always keep a pickaxe (Stone or Metal Pick) because you can mine crystals, metals and Obsisian. Obsisian is rare, it is gray and can be found on the ground. Chitin you will get only if you kill the insects in the caves. Caves often have very different temperature conditions. So there are hot lava caves, where sweating your character and on the other side there are ice-caves in which he or she freezes. Therefore, you should prepare yourself well on your caves adventure. Another important tip: If you realize that you are not up to the demands in the dungeon, then leave the cave quickly, level up fast- and then return with a higher level. Temperature: cold. Bring warm clothes and a torch. It is advisable to have a ranged weapon against the enemy in this cave. In addition, you should have some stim berries against scorpions. Construction: Bring enough supplies, since this cave is very large and the exploration can last longer. A ranged weapon and a torch are very important to succeed in this cave can. For your health you should pack enough Stim berries. Construction: This very narrow cave is probably not intended for large groups. Furthermore, you may have to jump to get through the cave alive. Take Blood packs and a ranged weapon with you. Temperature: In this rather hot cave you should rest your character often and let him do any strenuous tasks. Construction: You may need to jump to survive in this cave. Because of the high temperature in the cave you should bring enough water and Calien Soup. The latter increases your resistance to the heat. Moreover, Stim berries and Blood Packs to keep you health intact. Also recommend to take a ranged weapon. Construction: Very little space, crawlspace. Against the cold you should take a torch again. Recommend to take a ranged weapon and sufficient health resources: Blood Packs and Stim berries. Construction: Very rich canyon cave that requires again your jump skill. Take a ranged weapon with you to protect yourself and need a torch to keep you warm, and also take many Blood Packs and Stim berries to maintain your health. If you're looking for an underwater cave, keep your eyes open for air bubbles. Here you will find the entrance. The underwater caves are excellently suited to farm pearls, crystals and oil. You can dismantle the oily stones with any tool. Do you see luminous shells, then it often hidden pearls that can easily pick up with bare hands. To explore the caves, it is advisable either to tame a Megalodon or to have something cooked Lazarus Choweder (oxygen consumption is reduced). Since Patch 241.0 you have the chance to inhabit the new map "The Center," available as Mod Map. Here you will find very lucrative and challenging caves. Often the new caves have several entrants, but we will only show you each one. ARK: Northern Ice Cave on the map "The Center"
For this cave it is recommended to have the scuba diving equipment / or Lazarus Chowder, since it is very challenging to enter into the cave. You can also get help from even Dinos as Sarco, Beelzlebufo or Spino. ARK: Southern Ice Cave on the map "The Center"
Take with you cloth that protects you from the cold. The cave is very cold. 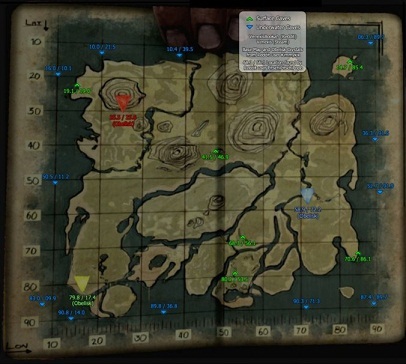 ARK: Small lava cave on the map "The Center"
Construction: In this little cave, you can take no dinosaurs, which are larger than saber-toothed tigers or wolves. Take appropriate clothing to overcome the freezing temperature in the cvave. In the cave there is a determined point which can be reached only with a tamed Pteranodon or a grapple. Take one of them with you, if you want to explore the cave fully. ARK: Large lava cave on the map "The Center"
Construction: This cave is very narrow and branched. To the east of the map, there is a volcano, on its eastern side you can find this cave. To get there you fly at best, because the opponents are very strong here. Take a Quetzal, Pteranodon or Argentavis with you. Alternatively, you can try with a grappling hook and a parachute. 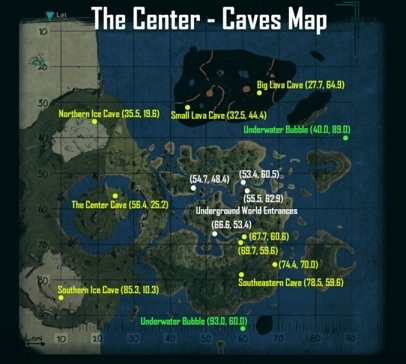 ARK: Cave in south-east on the map "The Center"
ARK: Center Cave on the map "The Center"
Construction: The eponymous cave for this map, can be found on the floating islands. As you probably noticed that there are still missing a few cave localities here. The reason is that our guide is still under construction and we will add them in the coming days.